When Lewis and Clark reached the mouth of the Columbia River in 1805, Captain Clark wrote in his journal, "Ocean in view, O! The Joy!" These words and the feelings they inspire now grace this beach house - the Ocean Joy. 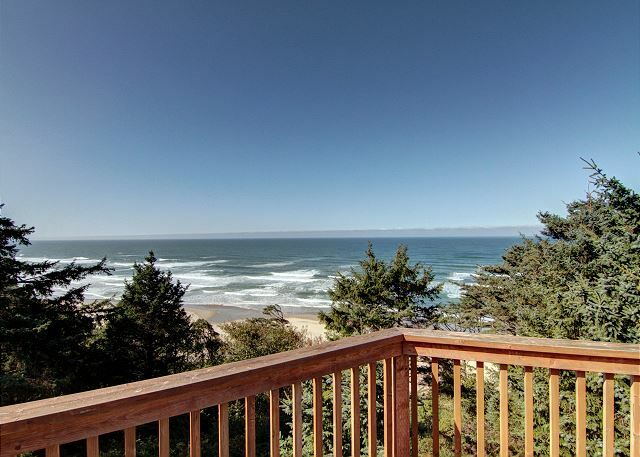 Spacious, tranquil, and beautifully set within a unique oceanfront and forest environment, this is the perfect place to enjoy Oregon's beautiful Arcadia Beach. 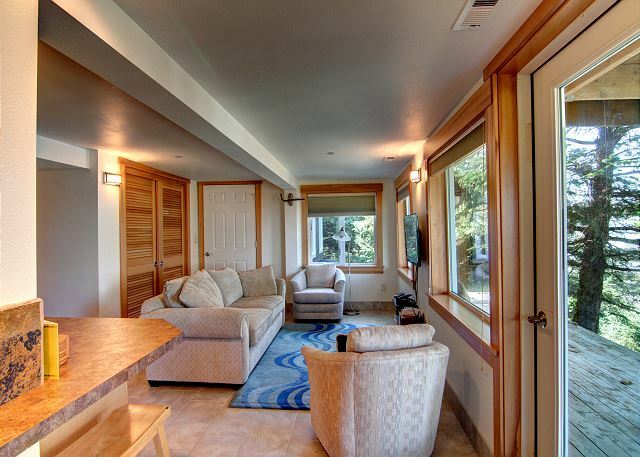 This 2300 square foot home is ideal for one or two couples, or a mature family (children 12 or older only). 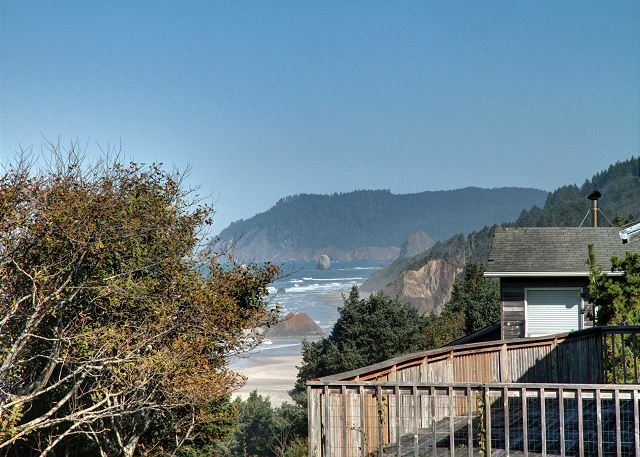 Surrounded by decks, the "eagle's nest" perched above has a 180 degree view taking in Haystack Rock, Tillamook Head, Castle Rock, and Arch Cape. The main decks and home have a partial view. 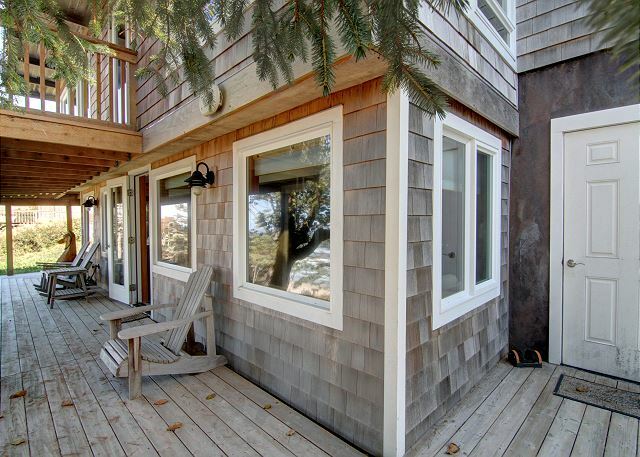 Located at the end of a wooded and quiet road, enjoy the tranquil path to a secluded beach. 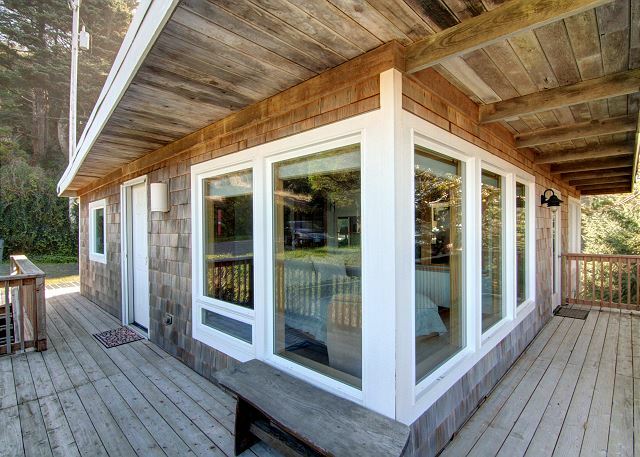 Its 2010 renovation and addition preserves an existing traditional beach cabin, while adding luxury in a light-filled, imaginative, homey design. 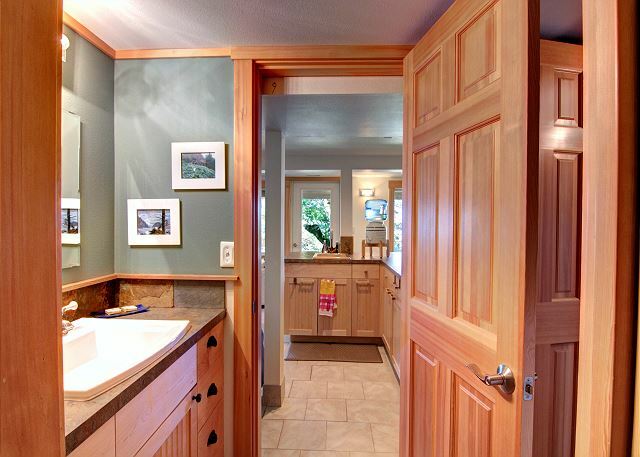 Enjoy its gorgeous light woodwork, hardwood floors, tasteful and artful decoration, and maple cabinetry throughout. 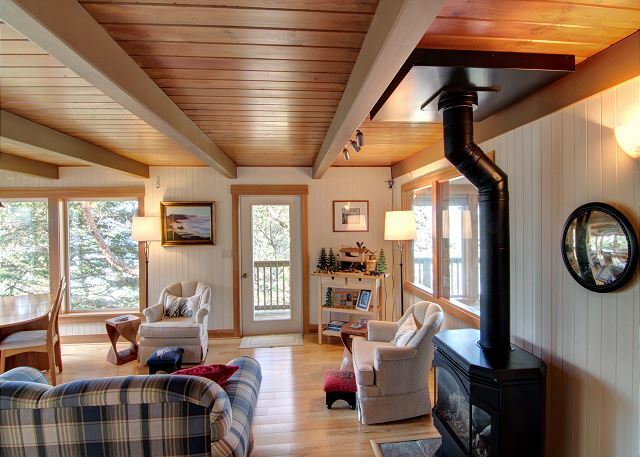 Chat in the mid-level cozy family / dining area enhanced by a gas fireplace, flames summoned at the flip of a switch, or enjoy views from the upper-level living / kitchen area. While the main level features the heart of the home with gathering areas, master Queen bedroom and bathroom, and an ample utility area, the lower floor's separate entries, Queen bedroom, kitchenette, 3/4 bath, and additional Full size sofa bed provides its own individual privacy. 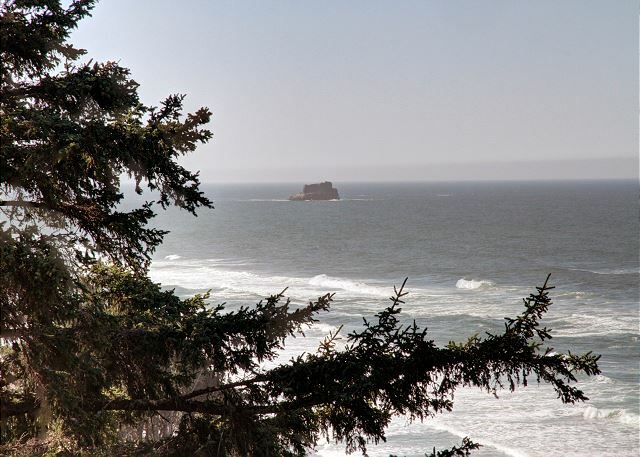 Let your spirit feast on gorgeous views from every room, or walk just a few minutes down a moderately steep path to the always-sandy beach to visit Hug Point tidal pools, dramatic sea cliffs, or perhaps spot the local bald eagles or deer. Though only four miles from the center of the Cannon Beach (by car), you're far enough away to have a beach mostly to yourself. This is an Ocean Joy you will remember fondly. Accommodates 6 maximum; no smoking; no pets; parking for 2 vehicles. 3 night minimum stay, except during summer months. 7-night minimum stay during summer months with a Sunday arrival date. The loveliest rental house ever! "This has been our fifth year enjoying Ocean Joy. The house and location is a little slice of heaven. 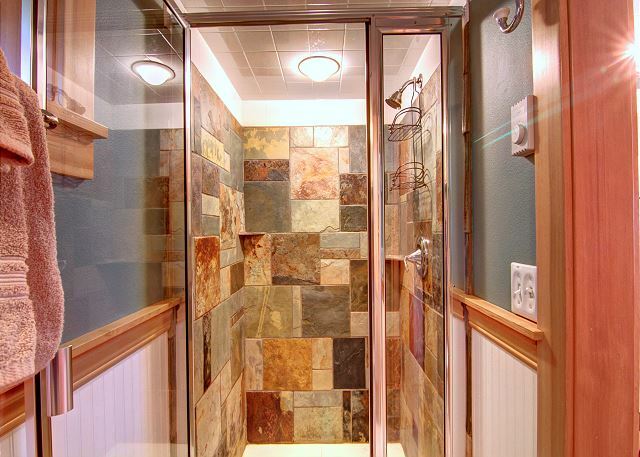 The owner has provided just about everything you could need to enjoy the property. The trail to the beach has gotten a little tough to navigate the last step so we drive to the Arcadia Beach access. Miles of walking beach to enjoy. This house has it all!" "Beauty of the home, the peaceful and beautiful location, proximity to Arcadia Beach"
"We spent 8 wonderful nights at Ocean Joy and did not want to leave. The home, its decor and furnishings are lovely and comfortable. Unlike many rentals, this home is fully provisioned with salt/pepper, bottled water, good working hair dryers, iron and ironing board, laundry detergent, every kitchen gadget, etc. Additionally, the towels are fluffy and the linens soft, including cozy throw blankets for naps. Although it was just the two of us, the two separate living areas, one on the main level and one downstairs, are perfect privacy for two couples. 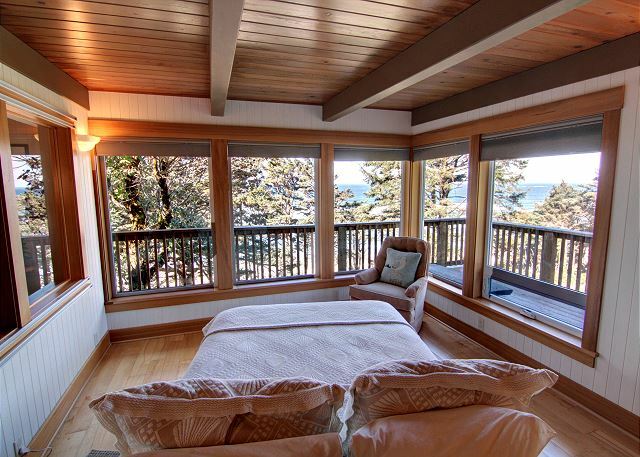 Both bedrooms are situated on corners that are all windows and those views! The house sits on a bluff surrounded by trees overlooking the ocean. It is just amazing to see and hear the ocean. 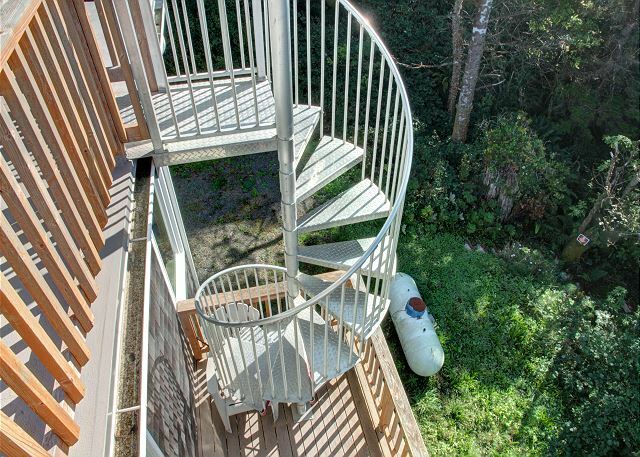 As other reviewers have noted, an outdoor metal spiral staircase takes you up to the roof for a 360-degree view. Also previously noted, the short hike down to the beach is quite steep up and down. The beach itself is quiet with only the occasional walkers. We would love to return to Ocean Joy and are green with envy of its owner!" "The house is roomy, comfortable and so lovely. A terrific view. Great beach location. " I am happy to hear you enjoyed the beach, come back and visit again soon! "The home was delightful in design and furnishings." "We found this place in late 2015 after a debacle with a VRBO and put it on our "for sure" list. We stayed here first on our 2-week trip on the Oregon coast - north to south. Hindsight....should have stayed here longer and nixed all the driving. Ocean Joy is roomy, felt right at home. Enjoyed reading about how it was remodeled and just the family connection. The juxtaposition of the beds in the glass cornered bedrooms, the views out of the kitchen, the rooftop aerie for my art journalling of the coastline...so lovely. Would return in a heartbeat." "The house and surrounding property was breathtaking. Every little detail was well thought out. Very private and peaceful and the views were amazing. I cannot wait to return." "This was our 4th time renting this house. It has been wonderful each and every time." "This was our second visit to Ocean Joy and we will be making this a regular visit. My husband Jim and I just love this place. It's like coming home. Last year we celebrated my 50th birthday and this year we celebrated out 30th wedding anniversary. We have made some amazing memories. This year we walked to town for dinner. And we for the first time went horseback riding on the beach. It was an amazing visit. " "Ocean Joy is the perfect spot for a quiet private vacation from the craziness of life. 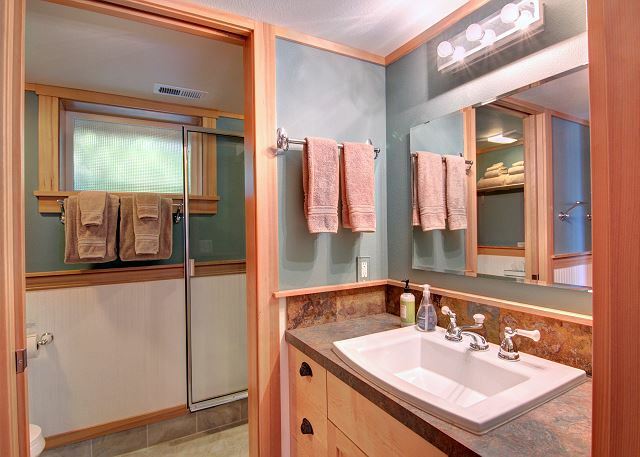 It is in a secluded location, but minutes away from Cannon Beach and plenty of activities and dining. The house is wonderfully appointed and if you like to cook you'll love the kitchen and dining at home. The views from every room are wonderful and the roof deck for relaxation and wine time are perfect. We've been here three years and are already looking forward to 2017!" "I had booked this property without showing my children. The best part of the whole vacation was watching my children as we neared the location of the property. The GPS was leading us as my kids watched anxiously, they were deciding whether to get excited or upset. We turned the corner as the GPS had instructed. In front of us lay a house that was quite run down and old looking. I saw my children's eyes go to the GPS then a look of satisfaction as they realized the GPS hadn't communicated that we had reached our destination. When we drove a little bit more, the most beautiful house lay in front of us, the house that the GPS labeled "our destination" . . . the kids were giggling with excitement. The house is beautiful and so much fun. The "porch" on the top of the roof was an all time favorite for everyone. We will definitely come back and enjoy this location again. My kids say it was the best vacation ever! " 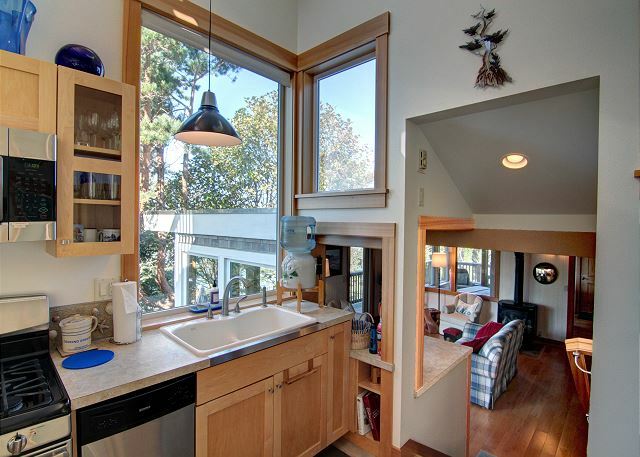 "This home has great use of space. 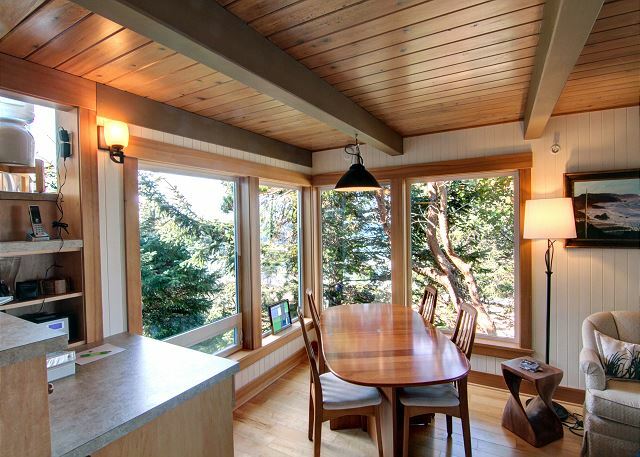 The living area had large windows perfect for enjoying the scenery. I highly recommend having a glass of wine while watching the sunset from the rooftop patio. I will definitely return. " "This was our third time at Ocean Joy. It was excellent as usual. We are trying to make it an annual trip. I haven't even looked for another place. This home has everything you could want." 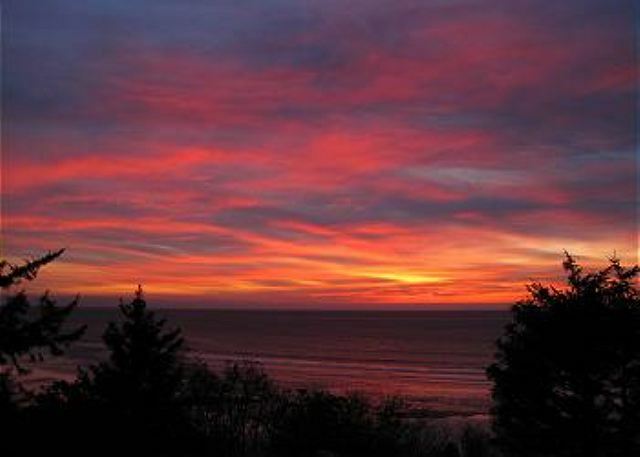 "this was our first time at Ocean Joy and in Cannon Beach at this time of year. Loved the house, it felt more like a home. The views were breathtaking and having a somewhat private beach was wonderful. We will be back"
CBPM are simply the best at managing this type of property in my experience"
"My husband rented this home for a week for my 50th birthday. We are from Michigan. Our oldest daughter moved out to Oregon 10 years ago and that is when we were first introduced to Cannon Beach. We fell in love. 3 years ago we rented a condo across from Mo's restaurant. We liked it but Ocean Joy has stollen our hearts. We loved the seclusion. But were minutes from town. We spent every night on the upper balcony watching the amazing view for the sunset and stars. It reminded us of our Northern Michigan. We appreciated so very much all the personal touches from the owner in the home. And it is a testament to the rental company that all of their personal things they leave for guests are perfectly maintained. We are already planning our return next year to Ocean Joy. Thank you for an amazing vacation. "Ocean Joy was the best! We never wanted to leave! Such an amazing place. We already planning our next trip to come back"
"LOvely property, very clean- only problem was stairs to the beach - the could be made more safe without much cost; this affected the answer to satification with property and location"
"We thoroughly enjoyed our time at Ocean Joy. The home was immaculate and so very well provisioned. We found ourselves wanting to stay "home" instead of going out to see the nearby sights! The view was tremendous, and the home has so many wonderful windows through which we could view it. We found the home to be even better than pictured on the site. 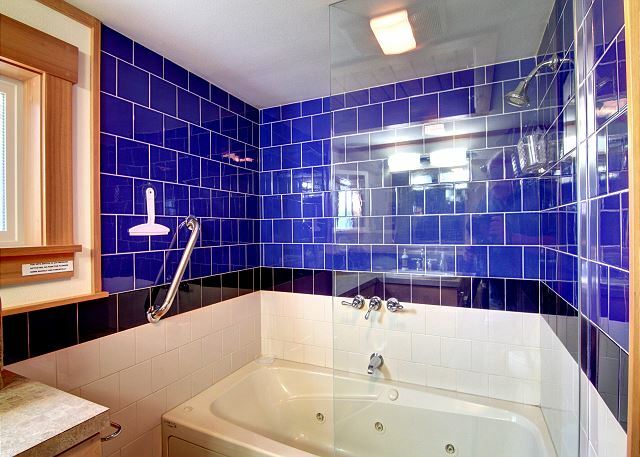 The 2 very upscale bathrooms were not pictured on the rental site. Everything in the home seemed new. We enjoyed long walks on our long stretch of nearly private beach. We would love to visit this home again." "Peaceful respite from the world. Very well equiped house for a great vacation. 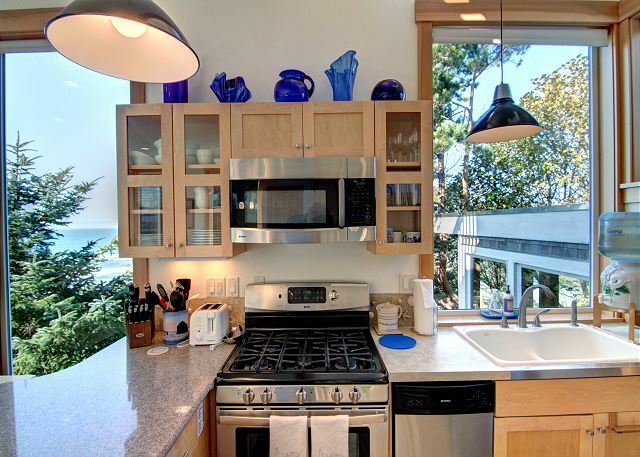 The kitchen has almost everything you can think of for homecooked meals with the best view in town! The addition of a Smart TV would be great, but limited channels make for catching up on reading. Th cliff path down to the beach ends with miles of packed sand for easy walking- sometimes we wished for an escalator back up though! LOL"
"We loved staying at Ocean Joy. The location on the beach was wonderful and the home had everything we needed. The steps to the beach are a little challenging but it easy to drive to nearby state parks and beaches if needed." "Our rental experience was perfect for a third time!" "I rented vacation homes 2/3 times a year and have for over 20 years. With that in mind this is a beautifully appointted and very well equipped home. This is my 3rd vist here!" 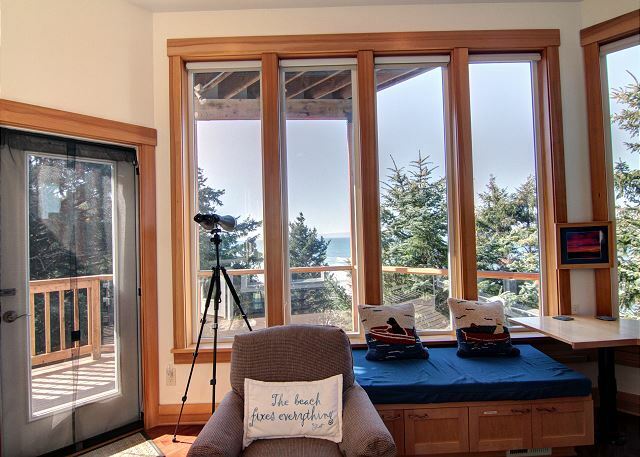 "We were seeking a tranquil, relaxing spot that was away from the crowds, with an ocean view but close to town. Ocean Joy is it. 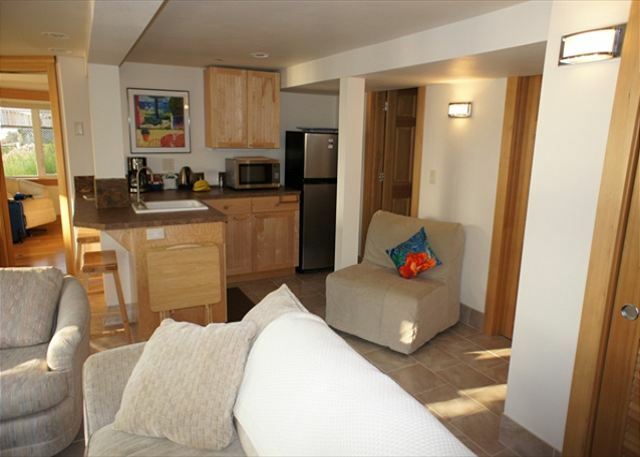 Clean, open, full of comforts and amenities "
"This location was perfect for our needs. 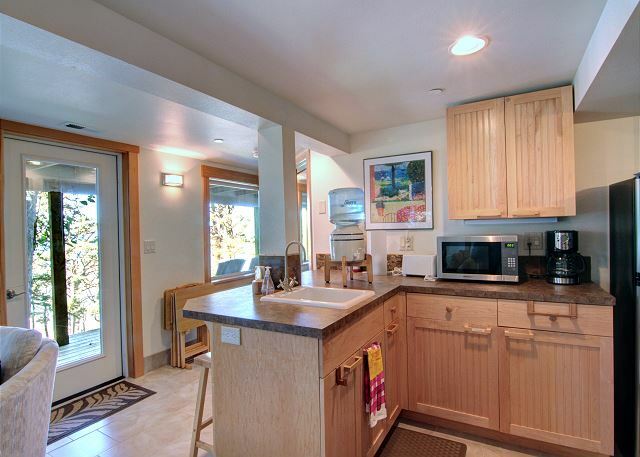 Private, access to the beach (may be difficult climb for some), full kitchen, everything we needed. We stayed here three years ago in 2011 and then again in 2014. Already making plans to return." "We stayed for a week in early April and loved the house and location. The views were tremendous (the crows nest deck on the roof is wonderful!) and we liked the nearby access down the trail to the beach. We worked a bit during our stay and greatly appreciated the office area off the main bedroom -- it is the perfect setup. We look forward to staying at Ocean Joy again." 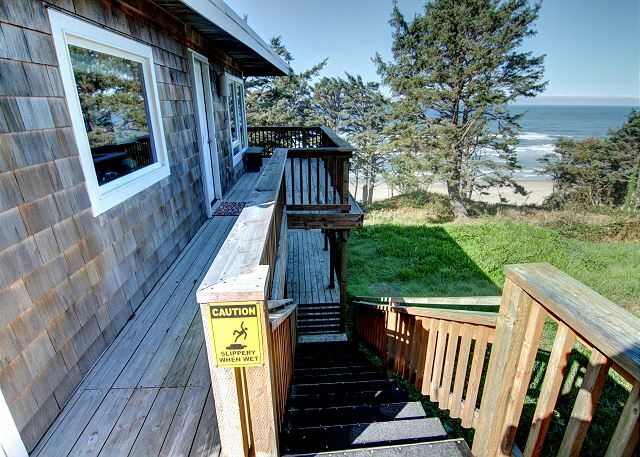 "Beautifully detailed home above an Oregon coast beach you pratically have all to yourself. Just minutes from other state parks and Cannon Beach, OR. Quiet, secluded and totally relaxing. Will definetly be back!" 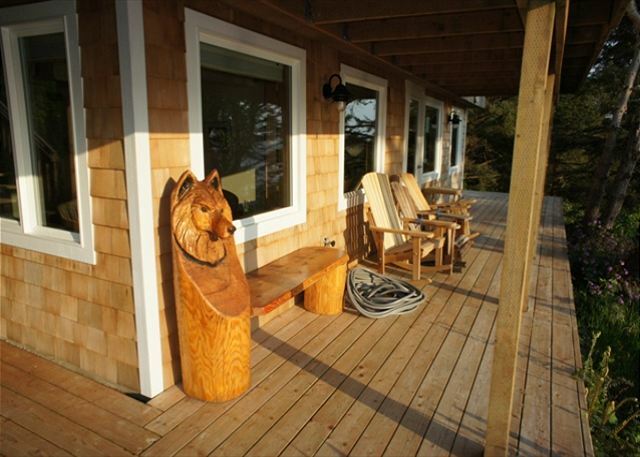 "If you are looking for a peaceful vacation home Ocean Joy could not be a better choice! We loved every minute. Long walks on the beach and lots of wine enjoyed on the roof deck. The sunsets were magnificent and the love felt from the house is hard to describe. The kitchen was well equipped and we cooked almost every meal at home. There are plenty of good restaurants within 5 minutes though. We look forward to our next trip to Ocean Joy." 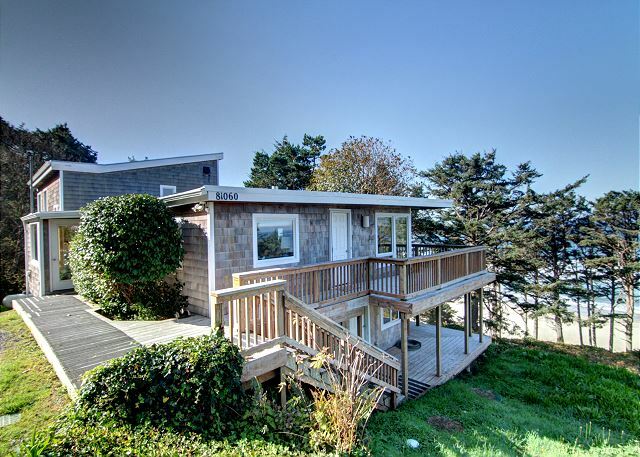 "We really enjoyed our stay at Ocean Joy, tremendous, Kevin B"
"My husband and I just needed a quick last minute getaway and rented Ocean Joy sight unseen. We were extremely pleased. The floor plan is great, allowing for places to hang out together and cozy places to curl up with a book alone. The kitchen has everything you could ask for and it's open position to the family room let's the cook be a part of the party. We both loved the privacy of the house and I could have spent hours on the roof top deck. We will definitely be back." 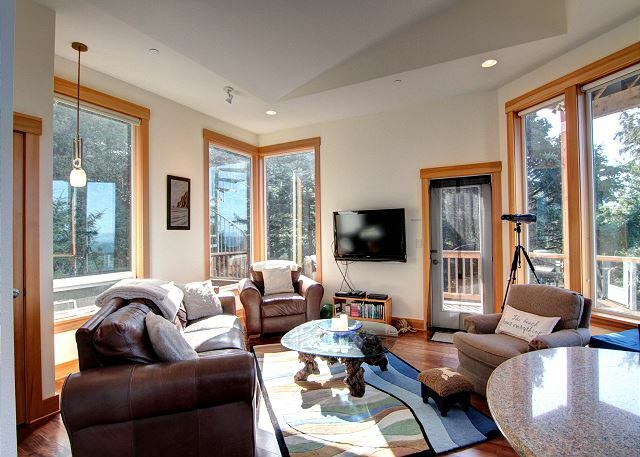 "Wonderful home with fantastic views! " "This was our 3rd time to Ocean Joy. I proposed to the woman I love down on the beach in front of the house. We love this place so much... next time we will try to do a bon-fire on the beach. The tides were too high, plus the hurricane winds made that impossible.. ha! Great place, a gem, nice and private to indulge yourselves. We will be back next year. This time in June or July.... :) "
"This is a very large two bedroom house located in a secluded stretch of Arcadia Beach. House has all modern amenities and plenty of space. Entry-level has an office, bedroom, kitchen, dining, full bath, and 2 sitting areas. Downstairs is configured as a mother in law suite with a bedroom, 3/4 bath, mini kitchen, and living area. There is a roof-top deck with views down the coast. 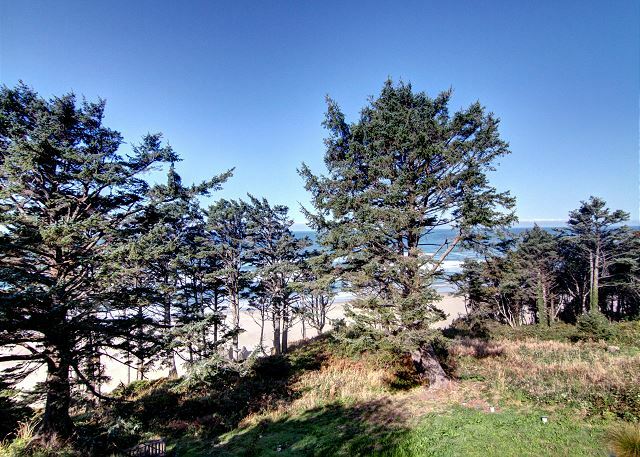 All rooms have a view of the beach through the trees. 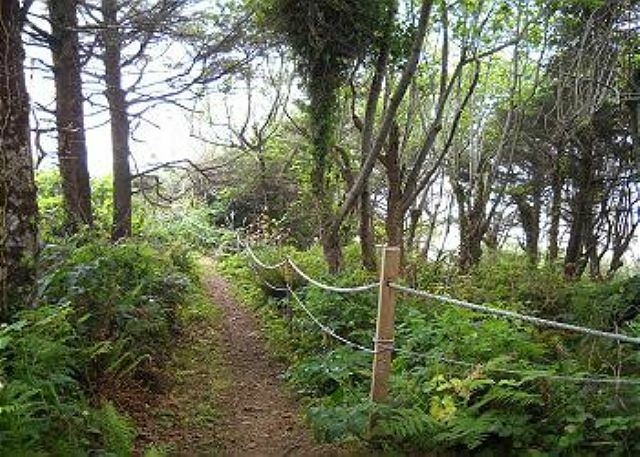 Beach is accessible via a somewhat steep path at the end of the road. There is easier access at the state park (2 minute drive). 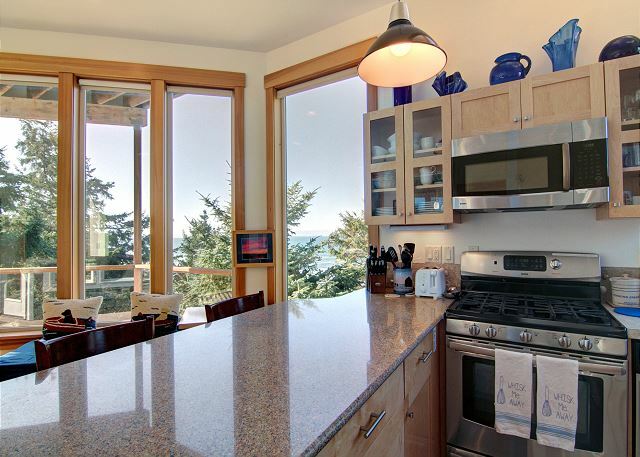 Cannon Beach commercial area is a 5 minute drive. 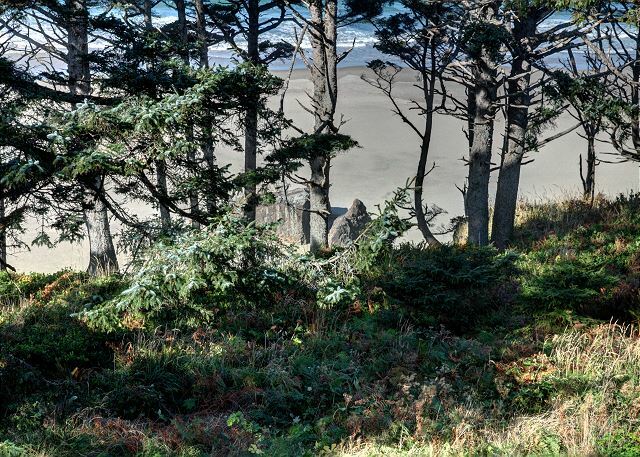 This is a very quiet location away from the crowds of Cannon Beach. Often, you can have the beach to yourselves. 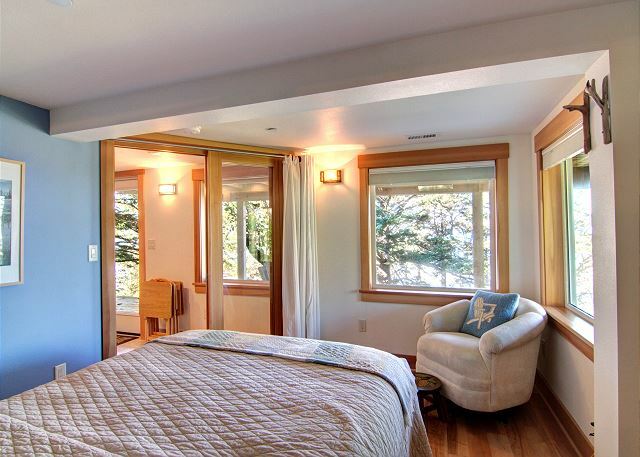 House is modern, clean, and well appointed"
"Our stay at Ocean Joy was indeed a joy. The house was very nice - very neat, with attention paid to all the little details that make your stay comfortable. It is on a very nice beach with direct beach access. We thoroughly enjoyed our stay and will return." "This property is a must stay. Beautifully decorated, spotlessly clean. Beautiful views, quite location. The only thing I could have wished for was more direct access to the beach. We will return...I LOVED THIS PLACE."